Hormel Girls, which just extended its run at the History Theatre through December 30, is about as good as a can of SPAM. If you like that kind of thing, you’ll thoroughly enjoy this musical. If you prefer, say, Kobe beef, you might want to sit this one out. Hormel Girls is about the sixty-plus World War II veterans (with some beauty queens thrown in) who comprised the first female drum-and-bugle band, and later hosted their own radio show. The act was an ingenious marketing tool created by J. C. Hormel to promote his plethora of canned meat products. The ladies toured the nation, singing and dancing their way into housewives’ kitchens and capturing the hearts of red-blooded Americans everywhere. 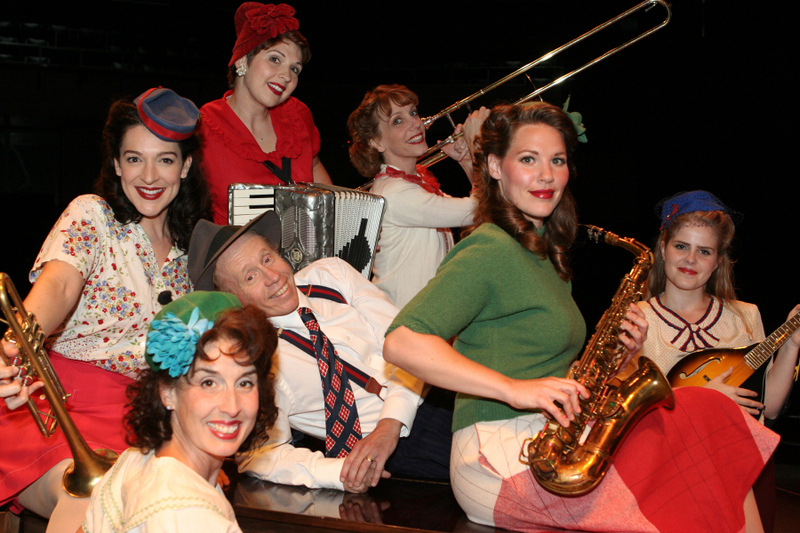 The music, written by Hiram Titus with lyrics and book by Laurie Flanigan, is written (so says the press release) in the spirit of the Andrews Sisters, which basically means there are a lot of all-female ensemble numbers; unfortunately, there are no hummable, memorable tunes. The main problem lies in the music’s predictability, as well as its appropriation. The show is titled Hormel Girls, but the men get all the solos. It makes one wonder whose story this really is—the tale of young women journeying into adulthood after World War II, or Hormel’s, whose fatherly affections help turn them into highly groomed pets. The actresses have perma-smiles, even when they sing about going crazy within the confines of life on the road. Individual personalities go mostly unexplored until act two. Jen Burleigh-Benz has some lovely moments as mother figure Meredith, and Sondra Norland wisely avoids turning her character into a stereotype. As for the men (Richard C. Grube and Mark Rosenwinkel), they get the best writing, the best songs, and have the most developed roles. It’s a shame, really. After sitting through two-and-a-half hours of nostalgia for the way things were—women in the kitchen, men allowing them to work—it would have been nice to get to know the women behind the SPAM. Hormel Girls continues at the History Theatre through December 30.